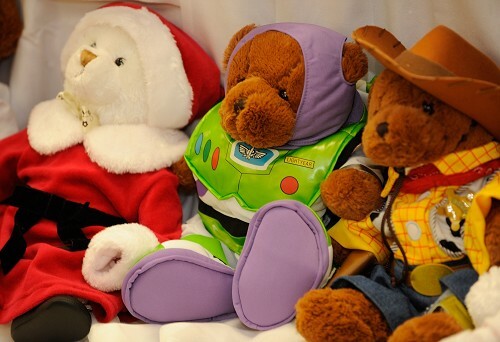 Disney VoluntEARS Create a “Beary” Christmas for Children in Need | Sew Lindsay, Sew! I love this article! Yet another way to put creative sewing skills (and fabric scraps) to good use for the community around the holidays. LAKE BUENA VISTA, Fla. Dec. 17, 2010 – A teddy bear is special gift. In an instant, it can become a child’s best friend. Partnering with the Salvation Army of Central Florida, Disney VoluntEARS dressed more than 2,000 bears during this year’s Dress-A-Bear program. 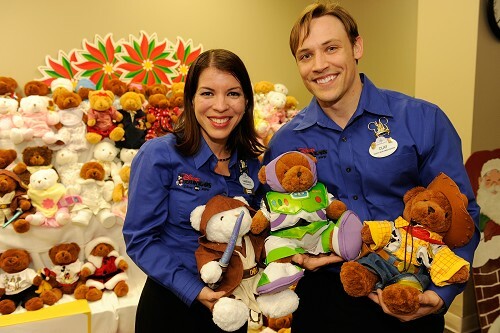 Walt Disney World cast members have been participating in the Dress-A-Bear program for the past 14 years. Janice Jones, Walt Disney World Costumer and Workroom Manager, has coordinated Creative Costuming’s Dress-A-Bear efforts since the program’s beginning. “It’s a creative outlet for cast members and it provides something special for children,” said Jones. Many of the bears receive one-of-a-kind outfits, handmade with great care by cast members on their own personal time. Using scraps of fabric and creativity, VoluntEARS craft cuddly ensembles from firemen to princesses. Buzz Lightyear, Rapunzel and the Mad Hatter were fashionable this year. All of these efforts are done in hopes of connecting with a child in need. “To be able to share our talents with children, and to make one of kind unique clothes, is a labor of love,” said Elizabeth Lau, Creative Costuming Workroom Manager. The special bears, along with 393 filled stockings, will be distributed by the Salvation Army of Central Florida to local children who are in need of holiday gifts.